Whether you are looking for a fun day out on the Vaal River, or a unique venue that offers Vaal River cruises for your social or corporate function, Liquid Lounge has the cruise boat for you! Offering the most memorable Vaal River Cruises, you will not be disappointed when you book one of the Liquid Lounge’s river cruises for your next event – big or small. The Liquid Lounge offers a few different options when it comes to Vaal River Cruises. Contact us for any of the following options for your cruise down the beautiful and scenic Vaal River. Sunday Lunches: If you are seeking a fun-filled day out on the Vaal River, book one of Liquid Lounge’s Vaal River Cruises – ideal for you to enjoy with family and friends. We have various Sunday lunches throughout the year, including wine or beer tastings and live entertainment. Lunch aboard our luxurious river cruiser will meet your every expectation – be spoiled with choice whilst dining from our Buffet lunch, complemented by drinks of your choice from our fully stocked cash bar. Enjoy your delicious meal with your loved ones, while cruising down a 56km stretch of the naturally beautiful surroundings of the Vaal River. View our events calendar for more information on upcoming lunches and events. Private parties and corporate functions: Why not book your next party or function with the Liquid Lounge and treat your guests to an unforgettable day! The Liquid Lounge is ideal for private parties such as birthday parties, baby shower, bachelor and bachelorette parties, wedding anniversaries and more. Vaal River Cruises are the perfect option when looking for that something extra in a function venue. Weddings: Searching for unique wedding venues in the Vaal Triangle? Visit the Liquid Lounge to see what our beautiful venue can offer you for your special wedding day. Adding Vaal River Cruises to your wedding day will make your special day even more memorable. Our professional team will take care of everything from the décor to the catering, to ensure that you and your guests have an enjoyable experience. 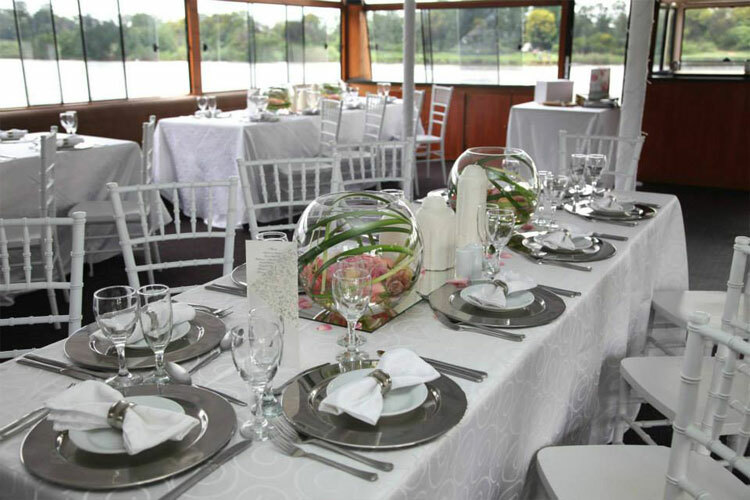 The breath-taking views that Vaal River Cruises have to offer will ensure that you have a truly beautiful and unique backdrop for your wedding reception pictures. Need to hire a boat? Whether you need a boat for a function, small party or weekend getaway, you will get the best experience from the Liquid Lounge and our other available vessels. The Liquid Lounge is the ideal river cruiser for your next function or venue, offering the opportunity to host your function in our beautiful river venue, whilst treating your guests to a spectacular river cruise down the Majestic Vaal River. Let our function coordinators take care of the detail and your guests needs, while you simply enjoy a memorable day out in the Vaal. 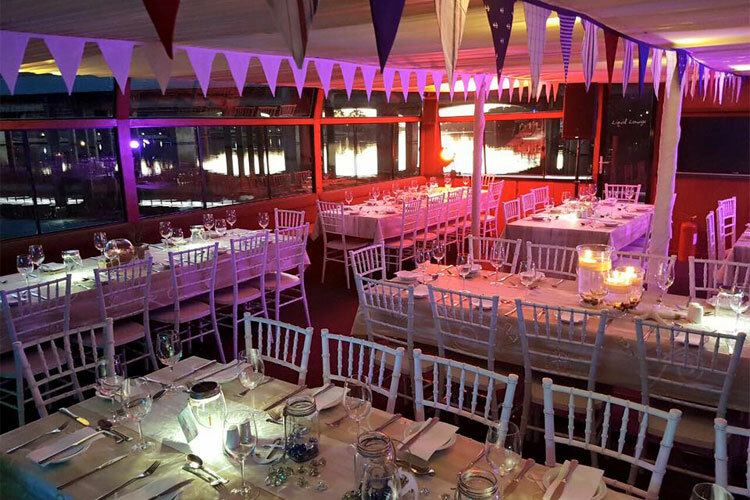 We have a number of River boats for hire, which includes our larger vessel, the Liquid Lounge, which is able to cater for large functions and corporate events, weddings and more. Should you wish to stay over in one of our house bats, we have two options available: the moored Prive’ Houseboat, and Liquid Living which is suitable for 8-10 guests. Enquire now about our Vaal River boat hire options available for your needs. A delicious buffet meal whilst cruising down the beautiful Vaal River is ideal for visitors to the Vaal Triangle, looking for a fun day out. Book your Sunday Lunch with the Liquid Lounge, to enjoy a memorable day on our luxurious river cruise boat. This river cruiser has been designed with comfort and luxury in mind, ensuring our guests will enjoy their day with us. Our chef will prepare the buffet dishes to perfection, offering an array of different items to suit different tastes. Enjoy your Sunday Lunch Cruise with family and friends, and take in the beauty that the Vaal River and surrounds has to offer. Our live entertainment will create the perfect atmosphere for your relaxing river cruise, making every moment enjoyable. If you wish to find out more about our Vaal River cruise boats, or specifically our next Sunday Lunch Buffet Cruise, contact us today. Best buffet restaurant in town! Looking to try something new this Sunday? If you are looking for a buffet restaurant in the Vaal Triangle that offers a delicious meal and enjoyable experience, then the Liquid Lounge is for you. Try our unique buffet restaurant in the Vaal, Liquid Lounge, and experience a memorable river cruise down the beautiful Vaal River. Liquid Lounge offers spectacular Sunday Lunches, with a buffet menu that will satisfy even the hungriest of tummies. View our events calendar to see our available dates for our Sunday lunch and other events. Book early to avoid disappointment! Need a function venue in the Vaal Triangle? Liquid Lounge is available for functions of all types and sizes. Whether you need a conference venue, wedding venue or party venue, Liquid Lounge can assist. Our experienced function coordinators will ensure that your function is a success and enjoyed by your guests. Your guests will truly enjoy the scenery and atmosphere while enjoying a refreshing drink during the river cruise. Book this unique river cruiser as your function venue today! Contact us for function packages and prices, and to book your date. If you’re searching for boat restaurants on the Vaal River, book your table aboard the Liquid Lounge river cruise boat today. You will be treated to a spectacular buffet spread, while cruising down a calm stretch of the beautiful Vaal River. Departing from Emerald Resort and Casino, our cruise boat is easily accessible for everyone. Enjoy some fresh air and a fun and memorable day aboard our luxurious river cruise boat. See our calendar for available buffet dates, and make your booking aboard the best boat restaurant on the Vaal River! If you and your friends are looking for some fun Vaal River events to enjoy over the weekend, the Liquid Lounge has just the outing for you! Enjoy a fun day with your closest friends and family aboard our spectacular river cruiser. Our river cruises offers the perfect outing for you and your friends / family to enjoy, including a relaxing river cruise, delicious buffet and breathtaking views – all while you sip on a refreshing cocktail. Read more about why you should book your Vaal River events aboard the Liquid Lounge, or contact us today to book your table for our next Sunday Lunch cruise. 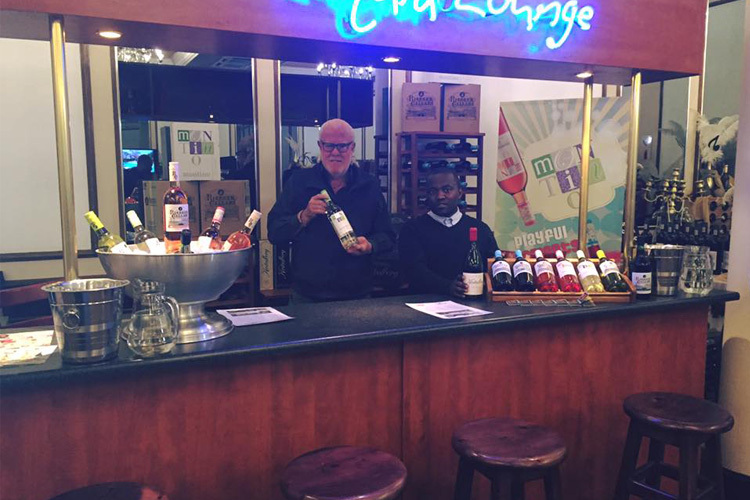 If you are looking for unique wine tasting experiences in the Vaal Triangle, then the Liquid Lounge is the place to be. Book a unique and enjoyable wine tasting event, combined with our spectacular Sunday Lunch Buffet. We trust that you will thoroughly enjoy your day aboard our river cruise boat, sipping on some new and refreshing wines in the company of your friends or family. View our next available wine tasting event dates to book your seats. Book early to avoid disappointment, our river cruiser is a popular outing for residents of the Vaal Triangle. Arranging your year-end function and finding no interest in the regular venues around Vanderbijlpark / Vaal Triangle? The Liquid Lounge offers a unique venue that can be used for your company’s year-end function party, that will offer employees an enjoyable and memorable event. Cruise down the majestic Vaal River while celebrating the end of another busy and successful year, aboard our luxurious river cruise boat. For more information or to book your year-end function date, contact the team at Liquid Lounge today! Whether you are searching for a cruise boat in the Vaal Triangle for a Birthday party event, company / corporate function or because you simply wish to treat your family to an outing on the Vaal River, you will experience the best river cruises in Vanderbijlpark aboard the Liquid Lounge. Our river cruise boat is a popular venue for residents in the Vaal Triangle and guests from across Gauteng who wish to experience a spectacular Vaal River cruise. Coupled with some fine dining, wine tasting and / or live entertainment, we guarantee a memorable day out. Enquire today about booking a table to join our Sunday Lunch Buffet or to book our venue for your next social event – make use of our beautiful and luxurious river cruiser for the best river cruises in Vanderbijlpark. Browsing through the Vaal River restaurants, but nothing catching your eye? The Liquid Lounge has the solution for you! If you are getting bored of regular restaurants for your family Sunday lunches, why not book your next lunch aboard our Vaal River restaurant, Liquid Lounge. Liquid Lounge is a popular cruise boat and restaurant in Vanderbijlpark and the Vaal Triangle, offering spectacular food, breathtaking scenery and a memorable experience. We also aim to make river cruises affordable, which is why we offer Sunday lunch cruises at very reasonable prices. Our cruise boat is suitable for the whole family, and is a great choice if looking to spend the afternoon outdoors. Enquire today about our buffet lunch aboard this Vaal River restaurant, and book your table today! The Liquid Lounge river cruise boat definitely is one of Gauteng’s best kept secrets. This little gem in the Vaal Triangle is a unique and popular Vaal events venue, ideal for your next corporate event, social get-together or private party. This function venue will offer a fun-filled event for all guests, who will enjoy a spectacular river cruise during the function. If you are seeking an events venue that is little out of the ordinary, book the Liquid Lounge for your next function today! Our professional team of function coordinators will ensure that your event runs smoothly and that everyone enjoys their time aboard this luxury river cruiser. Sip on a refreshing drink while you take in the beauty that surrounds the Vaal River, all in good company. Find out more about this Vaal events venue and the packages, menus and pricing options – Contact Liquid Lounge today! Looking for Vaal River Boat Hire / boat rentals in the Vaal Triangle? Liquid lounge can assist. We offer a number of options when it comes to boat hire on the Vaal River – enquire today about our party boat hire, houseboat accommodation and day rental options available. Enjoy an afternoon, day or weekend on the Vaal River with exclusive boat hire options available from Liquid Lounge. The Liquid Lounge is a luxurious river cruise boat, ideal for your next party, function or wedding, while Liquid living offers a more intimate river experience for smaller groups. The Prive’ and Fluxman houseboats are luxurious houseboats moored on the banks of the Vaal River, providing a relaxing and memorable experience for guests. For more information about any of these Vaal River boat hire options, contact Liquid Lounge today! Looking for the perfect destination in or around the Vaal Triangle for a romantic weekend getaway with your partner? Nothing is more romantic than waking up to the sounds of nature in a secluded destination with the Vaal River at your feet. Stay over for a weekend in a luxurious and comfortable houseboat that is permanently moored to the Vaal River banks. Although this boat does not cruise down the river, it offers an amazing and relaxing getaway experience for its guests. Read more about romantic weekend getaways on our exquisite houseboats, or book your weekend break today! If you are arranging a wedding and looking for unique outdoor wedding venues in the Vaal Triangle, you should consider Liquid Lounge. What’s better than cruising down a beautiful and tranquil river on your most special day? Cruising down a calm stretch of the majestic Vaal River on a luxury river cruise boat is any nature-lover’s dream. Your guests will still enjoy top class facilities, exquisite dining and fresh drinks, but in a natural setting. Book the wedding of your dreams aboard Liquid Lounge in Vanderbijlpark. Our experienced wedding coordinators will assist you every step of the way when it comes to your wedding venue and décor planning, to ensure that your day is exactly what you have envisioned. Get in touch with us at Liquid Lounge today to arrange an appointment to view our spectacular river cruise boat – your ideal outdoor wedding venue in the Vaal. Vaal River Cruises are fun for family and friends to enjoy together, offering you the opportunity to spend quality time with loved ones in a new and beautiful setting. For more information about the Vaal River Cruises and services available, contact us today and make your booking. If you are seeking luxurious and comfortable accommodation in the Vaal Triangle, give one of our lovely houseboat a try! Liquid Lounge offers two exquisite houseboats, both permanently moored on the majestic Vaal River. These houseboats offer unforgettable riverfront views, and an amazing experience for its guests. The Prive’ and Fluxman Houseboats are fully furnished, modern and comfortable, serving for a tranquil and enjoyable stay. Read more about the features and facilities of our houseboats, or contact Liquid Lounge for more information about these vessels for your Vaal Triangle accommodation today! Looking for places to stay for a weekend getaway in or around Vanderbijlpark? Liquid Lounge has the ideal solution for you. Try something different this holiday – stay in a luxury houseboat, permanently moored on the banks of the Vaal River! Just imagine waking up with the tranquil sounds of the water and surrounding nature. You will have your own braai facilities on the large deck, as well as a dining table, ideal for some quality family time. The houseboats are also self-catering, and suitable for families of four. Read more about this exquisite accommodation facility in Vanderbijlpark, or contact us today to book your weekend getaway on the Vaal River!